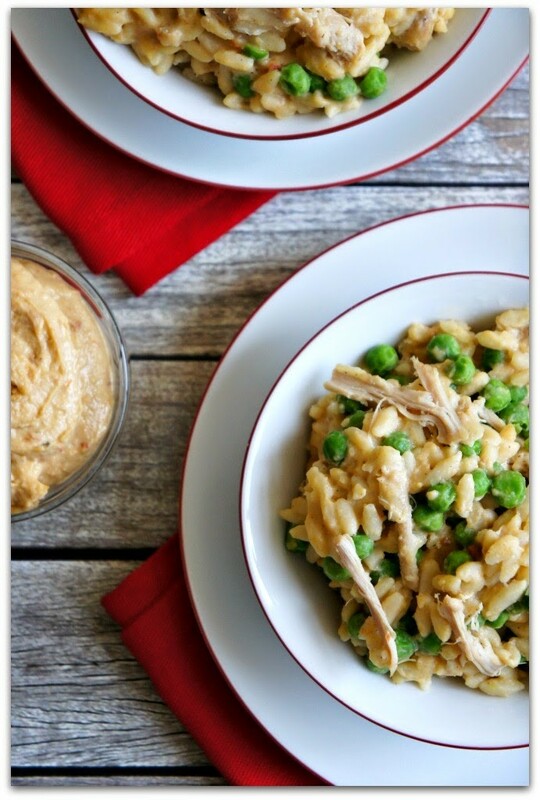 that is creamy, quick, easy and flavorful. Before I share this amazing recipe with you today I’d like to talk about cleaning. Cleaning my house is definitely not my favorite thing to do. As most of you that have children know, it seems like the minute I clean something in my house it is immediately dirty again. ARGH! Why clean it in the first place? Who’s the clean person at your house? My husband is definitely the one who cares more about a clean house. He gets frustrated with closets that become so full and unorganized that things fall out when you try to take something out. He’s also the “clean as you go” type of person. I’m more of the “wait until it gets so messy until I absolutely can’t stand it anymore and then go on a crazy cleaning spree” type of person. Remember this instagram post??? That’s totally me! I was photographing 7 recipes that day…so why clean as I go when I’m going to keep messing up the kitchen? Ha ha! I emailed that picture to my husband and I told him I was glad that he or his mother were not home that day!! Sometimes when I’m cleaning bathrooms or picking up around the house I get really angry. It just makes me annoyed and frustrated. BUT I have to say when I carry my ipod around with me and listen to some interesting podcast it makes the times go by faster and I sort of enjoy the job. Sort of. What are your favorite tricks/tips to keeping a clean house? Any podcasts that you would recommend? 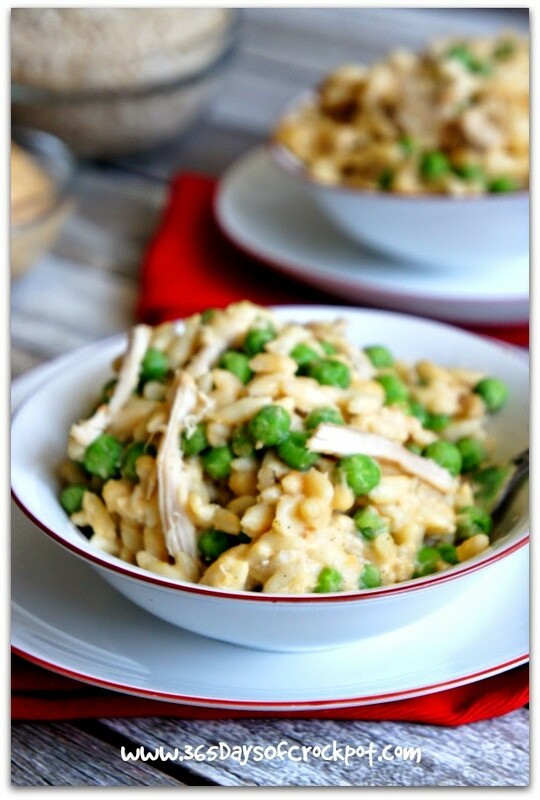 So onto bigger and better things than that unhappy topic…this recipe is awesome. You guys! It’s so super duper easy and it is a one-pot dinner. I knew you could make rice in the slow cooker so I figured I’d try it out with other grains. So first off, I decided to try and make orzo which is just pasta that’s kind of rice-shaped. I didn’t cook it before hand or anything. I added it into the crockpot with some chicken and broth and a couple of spices. I let it cook on low for about 3 hours until is started to get really tender and almost creamy. It sort of reminded me of risotto. Then I gently stirred in hummus and some peas (totally optional). The results were fantastic. I couldn’t believe how creamy and flavorful so few ingredients could be. The hummus I used was sundried tomato flavored and my favorite brand–Sabra. I bought a huge container of it at Costco when I was shopping while hungry (that’s exactly what you’re not supposed to do…hello $100 bill when I was going in for 2 things). 1. Place chicken in the bottom of the slow cooker, in one layer if possible. Sprinkle the chicken with the salt, pepper and garlic powder. 2. Pour orzo onto the top of the chicken evenly. Pour chicken broth over the top of the orzo so that it is completely submerged in liquid. 3. 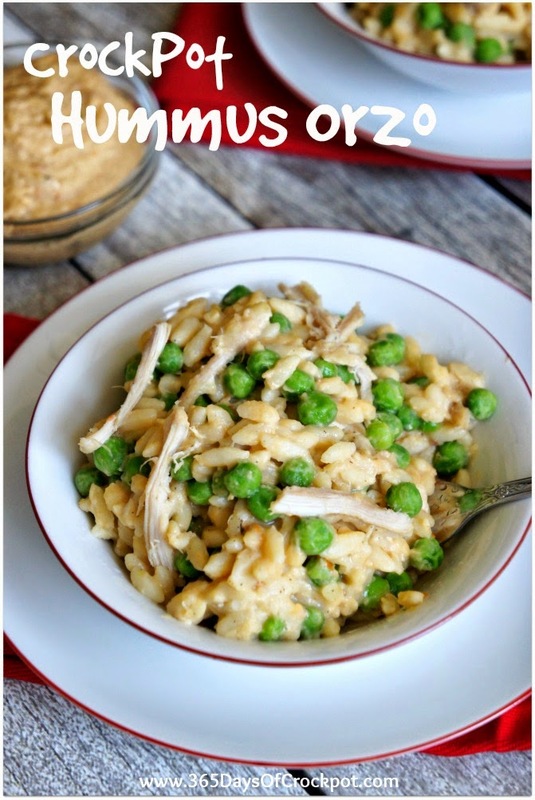 Cover and cook on LOW for about 2 1/2-4 hours or until chicken is cooked through and orzo is tender (I used my 3 quart slow cooker and it cooked in about 2 hours 45 minutes…if you use a larger slow cooker it may even cook faster). 4. Remove lid and use a fork to remove the chicken onto a cutting board. Shred or cut into bite size pieces. Add the chicken back into the slow cooker. 5. Place the peas and a cup of water into a glass bowl and cook in the microwave for about 1 1/2 minutes. Drain off all water and add the peas into the slow cooker. 6. Add the hummus into the slow cooker. Gently fold in the chicken, peas and hummus. The orzo will be really soft and tender so don’t mix…just gently stir until the pasta is coated with hummus. Scoop into serving bowls and enjoy! I just made this using leftover turkey from Thanksgiving. Really solid stuff with a lot of flavor. I’ll be making this again. I made this delicious dish this afternoon with 'Supremely Spicy Sabra Hummus' and put peas and carrots mix (the hummus and veg mix were at home and saved me a trip to the store). This was so good that even our 4 year old son liked it and asked for seconds. Will definitely try again. This looks delicious! I love anything hummus 🙂 Will any kind of hummus work? I have all the ingredients on hand except I have Sabra roasted bell pepper hummus. You can use whatever your favorite hummus is! Karen I am more like your husband and my husband is more like you. My tip is always empty your dishwasher out so as you cook, you can load it with the dirty dishes. Wash everything immediately and the kitchen will always be clean. When you are through with something – get rid of it immediately – newspaper, dirty clothes, useless mail, etc. etc. etc. Never put anything down that you know you will never use again – get rid of it. I am retired now so it is much easier for me but I wish I knew this when I worked. It would have made my life so much easier. Orzo in the crock-pot? Fantastic!